The Montclair Music Studio is proud to introduce Voice and Piano Instructor, Claudia Scaran. Living in Nutley, NJ, Claudia is currently teaching music in the North Bergen school system. 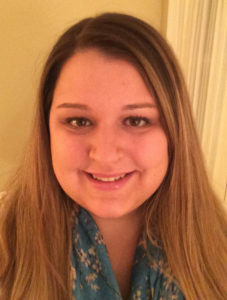 Ms. Scaran has graduated Montclair State University with a Masters Degree in Music Education. She has extensive experience working with both children and adults. Claudia feels that it is paramount to help each student achieve their own personal goals while introducing sound fundamentals. We are proud to have her with us. What brought on your interest in music? Music is a way to creatively express me and it peaked my interest at a very young age. I used to enjoy singing along to movies as a small child. In school, I joined various school ensembles all the way through high school. I enjoyed participating in chorus, orchestras, and musicals. When did you start your studies? I started violin lessons at the age of 8 and studied privately all the way through high school. I began piano at the age of 15. Was your family involved in music? My grandmother played the violin as a young adult. She even played during her college years at Ohio University. We shared a special connection through music. Unfortunately, no one else in my family has been musically inclined but they are very supportive. Have You Participated in Any Extra Curricular Organizations or music clubs? I have participated in various vocal ensembles in my college career. Currently, I participate in my church chorus and cantor services. What are other types of instruments in your repertoire? Besides voice and piano, I am able to play the violin as well as percussion instruments. Have you played at other venues? I have performed at the New Jersey Performing Arts Center, the Morristown Performing Arts Center, The Riverside Church (NYC), Disneyland, and even a cruise ship. Any favorite hobbies other than music? I enjoy traveling, reading, and spending quality time with friends and family.